The Sony a3000 is a compact and affordable ILC that provides great image quality and good performance. It is also one of the most affordable ILCs on the market, and great idea for anyone that is looking to take on their first dSLR/ILC. Read more in our Full Conclusion. Read more in our Full Conclusion. In late August of 2013, Sony announced the α3000, or a3000, a "DSLR-style" interchangeable lens camera (ILC). While not a traditional DSLR, the α3000 is built to look like one, and features a 20.1 megapixel Exmor APS-C HD CMOS image sensor, Full HD video recording, a 0.5 inch electronic Tru-Finder with 100% field coverage as well as a 3.0-inch "Live View" enabled LCD display, a P/A/S/M Mode Dial, and 15 Picture Effects. Mike Kahn, director of the interchangeable lens camera business group at Sony says, "The new a3000 represents the ultimate combination of performance and value in an interchangeable lens camera. With a familiar, comfortable shooting design, impressive imaging capabilities and an outstanding price, it's the ideal choice for customers looking to experience the vast benefits of large sensor, interchangeable lens imaging for the very first time." 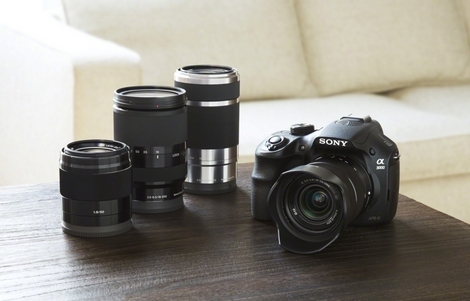 The α3000 is compatible with all Sony E-mount lenses. Sony's α3000 (or a3000) interchangeable lens camera is available now with a MSRP of $399.99, which includes an 18-55mm zoom kit lens (SEL1855). Click our Buy button to see the most current online pricing.